One of the most dynamic young sires to come along in the past decade. From an amazing 2 yr. old dam and paternal sister to CCR Cowboy Cut, that descends from one of the premier Cow Camp Ranch cow families. Powerfully built, super sound, athletic, gentle and with ‘extraordinary’ numbers. 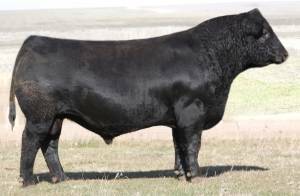 Frontier sired the ‘power bulls’ of the CCR 2015 sale, and ‘Flint Hills’ was his premier son.